Attractions in Ripon, North Yorkshire. On Tuesday 23rd April 2019 the sun will rise at 05:47 and will set at 20:24. It will be a mild day, with temperatures reaching around 16.8°C. Today is expected to be a dry day, with a very low chance of rain. It will be quite a breezy day, with a maximum expected wind speed of 15mph. On Wednesday 24th April 2019 the sun will rise at 05:45 and will set at 20:26. It will be a mild day, with temperatures reaching around 13.6°C. Today is expected to be a dry day, with a very low chance of rain. It will be quite a breezy day, with a maximum expected wind speed of 17mph. On Thursday 25th April 2019 the sun will rise at 05:42 and will set at 20:27. It will be a mild day, with temperatures reaching around 14.6°C. A few showers are expected, 3mm of rainfall is possible today. It will be quite a breezy day, with a maximum expected wind speed of 21mph. On Friday 26th April 2019 the sun will rise at 05:40 and will set at 20:29. It will be a mild day, with temperatures reaching around 11.2°C. A few showers are expected, 4mm of rainfall is possible today. It will be quite a breezy day, with a maximum expected wind speed of 19mph. On Saturday 27th April 2019 the sun will rise at 05:38 and will set at 20:31. It will be a mild day, with temperatures reaching around 9.6°C. Today is expected to be a dry day, with a very low chance of rain. It could be quite a gusty day today, with a maximum expected wind speed of 34mph. On Sunday 28th April 2019 the sun will rise at 05:36 and will set at 20:33. It will be a mild day, with temperatures reaching around 12.2°C. Today is expected to be a dry day, with a very low chance of rain. It could be quite a gusty day today, with a maximum expected wind speed of 38mph. On Monday 29th April 2019 the sun will rise at 05:33 and will set at 20:35. It will be a mild day, with temperatures reaching around 5.9°C. Today is expected to be a dry day, with a very low chance of rain. It will be a very clam day today, with a maximum expected wind speed of 6mph. 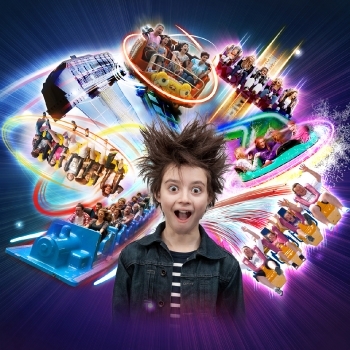 Discover the excitement of a day bursting with thrills, chills and adventure for the whole family at Lightwater Valley in the heart of North Yorkshire. Catapult to dizzying heights aboard Whirlwind and hurtle through some of our deepest, darkest forest aboard Europe’s longest rollercoaster – The Ultimate. Eager young explorers can venture into the swashbuckling world of Skeleton Cove before discovering the mysterious subterranean world of Raptor Attack's abandoned mineshaft, shooting the raging water of the Wild River Rapids and taking to the skies in the powerful grip of the Eagle's Claw. New for 2015, take a ride on our Vintage Car Rally where the little ones can take the wheel, plus don't forget your adventure also includes the UK's largest Angry Birds Activity Park with 30,000 square feet of interactive play including tube slides, dance zones, gigantic screens and lots of space to run off all that energy!